In a world beset in deepening shadow, with the constant threat of rampaging beastmen, ravenous ogres gorging themselves on whatever they can catch, and weird monsters creeping in the gloaming searching for prey, the gentle and bucolic halflings seem almost out of place. A people famous for their good-natured manners and peace-loving ways, as well as their uncanny luck, halflings have done their best to avoid the troubles in the world, keeping fast to the idyllic lands in which they have settled. But in these troubled times, such isolation is becoming increasingly impossible. If any people would hold onto their customs, their ways of living, and, indeed, their very families, they must stand up and be counted, and take up arms in the struggle against the evil unfurling its wings across the world. Despite the fortune that has blessed them, the halflings are no longer an exception to this. 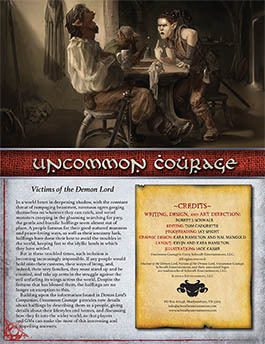 Building upon the information found in Demon Lord’s Companion, Uncommon Courage provides new details about halflings by describing them as a people, giving details about their lifestyles and homes, and discussing how they fit into the wider world, so that players and GMs can make the most of this interesting and compelling ancestry.